The Moon is the only body on which we can see surface features with the unaided eye (Plate 7). The dark areas are the maria (singular, mare). These are relatively smooth, and they lie amidst more rugged highland terrain that constitutes most of the lunar surface. The highlands reach up to 16 km above the lowest lying regions, and are dominated by impact craters. The Moon is in synchronous rotation around the Earth. Therefore one side - the near side -always faces towards the Earth, and the other side - the far side - always faces away from the Earth. However, this does not mean that one face of the Moon never sees the Sun. 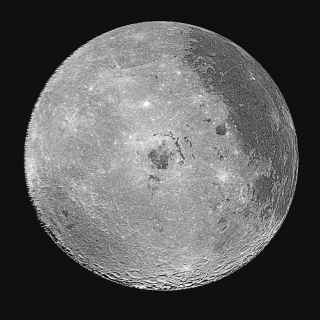 When we see the Moon as less than full then part of the near side is in darkness, and consequently part of the far side must be in sunlight. With no atmosphere to moderate surface temperature, the temperatures at the equator reach about 400 K at lunar noon only to plunge to about 100 K at lunar midnight. At any point on the lunar surface the average time between successive noons -the lunar 'day' - is 29.53 days. A moment's consideration will show that this is also the average interval between successive new Moons, an interval which is called the synodic month. • the radius of the Earth were negligible (so we would always observe the Moon from the same vantage point as the Earth rotates). None of these conditions is met, and as a result, from any point on the Earth's surface, the Moon appears to rock slowly to and fro (east-west) and nod up and down (north-south). These are called geometric librations, and they allow us to see 59% of the lunar surface over a period of about 30 years. In addition, because of tidal forces, the lunar rotation rate oscillates, and consequently there is a physical libration that allows us to see a tiny bit more. Nevertheless, about 40% of the lunar surface was hidden from us until 1959, when the spacecraft Lunik III provided us with our first images of the far side. A more recent image of part of the far side is shown in Figure 7.1. A further consequence of the eccentricity of the Moon's orbit around the Earth and the tilt of its rotation axis, plus the Earth's orbital eccentricity and other effects, is that the lunar 'day' varies slightly in length. Impact craters are the dominant lunar landform. Much of the highlands is near to saturation, indicating great age. The largest impact craters are the impact basins, many of which have subsequently been partially filled to create the maria, which constitute about 17% of the lunar surface. The maria are concentrated on the near side (Figure 7.1). The largest impact basin of all, the South Pole-Aitken Basin, is on the far side near the South Pole. It has a maximum depth of 8.2 km below the reference ellipsoid that defines zero altitude, and a diameter of 2250 km, making it the largest known impact basin in the Solar System. There is very little infill. The impact might have excavated the upper mantle, and image analysis is consistent with the presence of silicates richer in iron and magnesium than those in the crust. There is plenty of evidence that the maria are partially filled impact basins. The circular nature of the mare boundaries (Plate 7) and arc-shaped mountain ranges within the maria surely indicate a multi-ring impact basin beneath. Further evidence is provided by gravitational field measurements which show that coinciding with many maria there is excess mass - a mass concentration called a mascon. One possible cause is the upward bowing of relatively dense mantle immediately after the impact. The bowing would have greatly reduced the mass deficit after excavation, but would still leave a depression. Any subsequent infill of the basin would create the mascon, provided that the lithosphere had by then become too rigid to achieve isostatic adjustment (Section 4.1.5). In some cases, the upward bowing could have been excessive, owing to rebound held in place by a rigid lithosphere, which would create a mascon before any infill. Studies of impact basins, filled and unfilled, indicate that the Moon has long had a thick lithosphere that has prevented isostatic equilibrium from being achieved. There is a good deal of evidence that the mare infill is mainly lava, and not debris from later impacts, nor migrating dust. For example, mare samples have a basaltic composition, in sharp contrast to the pyroxene-poor composition of the surrounding anorthositic highlands (Table 6.1 and Section 7.1.6). Also, shallow channels, called sinuous rilles, snake across the maria -these could be the remnants of lava supply channels or collapsed lava tubes. Some linear rilles might be graben created by the extraction of subsurface magma. More obvious signs, such as volcanoes, are represented by only a handful of small features, and so it is presumed that the upwelling of the lava was mainly through fissures that the lava itself buried - there are terrestrial examples. 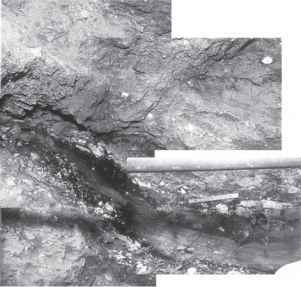 Had the lava erupted all in one go, the resulting fluid would have filled the basin to the level required by isostatic adjustment and there would be no mascon. It is therefore necessary to suppose that the infill was in a series of sheets, each a few tens of metres thick. There is evidence for such sheets on Mare Imbrium, in the form of scarps on the surface (Figure 7.2). It is widely believed that the mare lavas are derived from the partial melting of the mantle a few hundred kilometres beneath the lunar surface, the melting being aided by the release of pressure as the mantle material ascended. Detailed studies of large basins of different ages suggest that this infill was available more readily early in lunar history than later, and this indicates that the lithosphere gradually thickened as the interior cooled, making it more difficult for lava to be released after later large impacts. Even so, the magma always took some time to reach the surface. Radiometric dating shows that several hundred million years separated maria basin formation from maria infill. □ What other evidence is there that the maria surfaces are younger than the rest of the lunar surface? 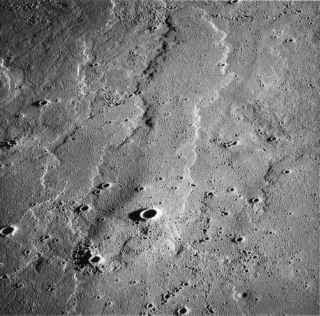 The low density of impact craters on the maria surfaces also indicates relative youth. There is thus plenty of evidence for the delay in mare infill necessary to explain the maria mascons. On the far side there is less infill of impact basins. The second largest of the far side basins, Mare Orientale, about 900 km across, is in the centre of Figure 7.1. It is only slightly filled, and the gravitational field shows a deficit of mass - a 'negative mascon'. The lack of infill on the far side is a possible outcome of the observed higher altitudes of the basin floors there than on the near side, which could have placed the far side basins beyond the reach of magma. The exception is the South Pole-Aitken Basin, which is so deep that the lack of infill indicates significant regional differences in the properties of the crust and upper mantle. Another striking difference between the near side and the far side is the crustal thickness. This has a near side mean value of about 40 km, but gravitational and topographic measurements, particularly by the Clementine Orbiter (Table 4.1), have shown that the mean thickness on the far side is about 12 km greater than on the near side. On a regional rather than hemispherical scale, the thickness of the crust varies over the approximate range 20-120 km, though it is much thinner than 20 km in the South Pole-Aitken Basin. These regional variations must be due in part to the transport of crustal materials across the surface of the Moon by giant impacts, and this could also explain the difference on the hemispherical scale. Another regional factor with hemispherical consequences might be major variations in the extent of melting of the lunar exterior. Additional possibilities are that erosion by mantle convection early in lunar history moved crustal material from the near side to the far side, or that mantle convection has reincorporated into the mantle more of the near side crust than the far side crust. Tectonic features include faults and ridges, largely confined to the maria, and some of the linear rilles - these occur in the highlands and on the maria. These features can be explained by a combination of crustal tension early in lunar history, crustal deformation around impact basins, and cooling of lava. Gradation is confined to mass wasting and impact-related events. There is no evidence at all that the Moon ever had oceans, lakes, rivers, or an atmosphere of any significance to weather the surface, though there might be water ice in craters near the poles whose floors and some walls have been shaded from sunlight for at least the last 1000 Ma or so, with temperatures persistently around 100 K. The Moon must have been so dry at birth that any water is likely to have been delivered subsequently, by volatile-rich impactors such as comets, or perhaps by solar wind ions. In 1996 radar data from the Clementine Orbiter found indirect evidence of ice near the South Pole in the sloping walls of the Shackleton Crater (whose floor cannot be seen from the Earth). In 1998 the orbiter Lunar Prospector, using neutron spectroscopy, found indirect evidence of ice at both poles. In the case of the Moon, low-energy neutrons were detected that have been generated by cosmic ray impacts on lunar surface materials, and lose much of their energy in collisions with hydrogen atoms. Assuming that water is the dominant source of the hydrogen, a few per cent by mass of the top metre or so of the surface in various polar craters would be water ice. Any such water must have migrated there from elsewhere on the Moon, and has survived because the sublimation rate from permanently shadowed areas is very low, though dust protection might be necessary to shield any water from photodissociation by UV radiation from starlight. Doubt about the existence of near-surface water ice came when the Lunar Prospector mission was ended by crashing the spacecraft into a crater near the South Pole on 31 July 1999. The Hubble Space Telescope and Earth-based telescopes searched unsuccessfully for spectroscopic evidence of water. Further doubt has since been cast by radar data from the 300 m Arecibo radiotelescope on Puerto Rico. Radar provides evidence for large lumps or sheets of ice because it gives a strong reflected signal, not so much from the surface, but throughout a depth equal to several wavelengths of the radar. At a wavelength of 0.7 m, Arecibo has failed to detect ice anywhere, thus ruling out large lumps down to a depth of about 5 m. The positive radar outcome from Clementine could well be due to its observation of a sloping crater wall. A rough surface at a low angle can mimic water ice because it too reflects radar strongly. To explore the upper metre with greater precision, Arecibo also used a wavelength of 0.12 m, again with a null outcome. □ How can this be reconciled with the Lunar Prospector detection of hydrogen to this depth? A possible reason is that the ice is not present in large lumps or sheets but as tiny particles mixed with the dust and rubble, perhaps generated by solar wind ions that gave rise to frosts. side maria. In all cases the samples comprise small rocks found lying on the surface, pieces chipped off larger rocks, and samples from cylindrical tubes that have penetrated to 2.4 m below the surface. The orbiter SMART-1 carried out a global survey of the elements at the lunar surface by X-ray fluorescence spectrometry (Section 6.1.2). 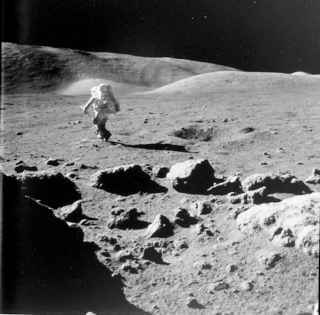 The surface of the Moon is covered in fine dust, called lunar fines or 'soil'. Figure 7.3 is a typical view of the dusty surface. The fines are a complicated mixture of silicate rock fragments and glassy particles with much the same composition at the nine sites from which it has been sampled. On the maria the fines have albedos of only 5-8%, whereas in the highlands the values are in the range 9-12%, which is why the highlands look brighter. There are four sources of the fines: recondensed minerals that were melted or vaporised by impacts; fine ejecta; surface rocks fractured by micrometeorites; and dust infall from space. As well as the fines there are lots of small rocks, but few large ones. These small rocks are mainly breccias ('bretchy-ars') - the result of pressure and temperature welding of rock fragments by impacts. Fines plus breccias dominate throughout the length of the core samples. The whole assemblage of fines and pieces of rock is called the regolith. What lies beneath the regolith? Seismic data from landers, all on the near side, are shown in Figure 7.4, and indicate that beneath the regolith there is broken rock that becomes fully compacted at a depth of about 15 km (perhaps a bit deeper). □ What does the sharp increase in speed at the greater depth of 40 km indicate? The sharp increase in speed at about 40 km (at least on the near side) is widely interpreted as a change in composition at a crust-mantle interface.